Home / Photo Reports / A Sperm Whale Carcass in Hawaii! Majestic, graceful, and ever so vital to the health of our oceans, large predatory sharks are awesome! For me, seeing these apex predators underwater is humbling and a lot of fun. But finding and photographing large sharks up close in clear water is not easy these days and often involves distant travel, a specialized dive operator, and, usually, extensive baiting. My dream has always been to find sharks feeding on a whale carcass. Few natural events will attract a greater diversity of large sharks like a dead whale—a 30–40-ton, floating, all-you-can-eat buffet. There’s no better time to photograph these big animals than when they’re gorging themselves with calorie-rich, blubbery goodness. In January of 2019, my dream became a reality when a sperm whale carcass floated right into our back yard—the south shore waters of Oahu. Sperm whale (Physeter macrocephalus) carcass floating in coastal waters off Oahu, Hawaii. Sperm whales usually live for over 70 years but sometimes die younger from disease or predators (most often orcas). Ever-increasing numbers also get tangled in fishing gear, collide with ships, or die from pollution, such as oil spills or plastic ingestion. 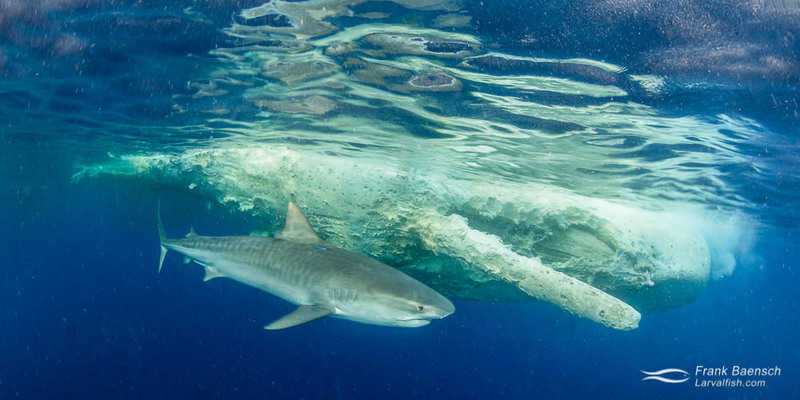 Decompositional gases build up and usually keep a carcass at the surface where it often becomes an important food source for scavenging sharks and birds. In fact, even though dead whales are rare, they may significantly contribute to a shark’s overall feeding strategy (Fallows et al., 2013). After all, blubber is a calorie bomb. A bloated whale’s gas pockets eventually rupture, and it sinks (a “whale fall”). In shallower waters, the carcass will be consumed by scavengers relatively quickly but, in deep water, whale falls create complex, localized ecosystems that sustain hundreds of deep-sea species for decades. So, even in death whales are an important part of the life cycle within our oceans. One to four dead sperm whales wash ashore in Hawaii each year, according to Hawaii’s Department of Land and Natural Resources (DLNR). We found the carcass eight miles offshore in the late afternoon. My friend had photographed a large, pregnant white shark feasting on the carcass the day before. The story had made the news and some phenomenal images had gone viral. But today, we were not alone. Four other boats packed with noisy spectators encircled the 30-foot dead whale and close to a dozen people were in the water. Not the scene that I had envisioned! Even large predators get intimidated when enough people intrude on their meal. In fact, we saw nothing but people when we first got in the water. As we distanced ourselves from the crowd, our luck improved. A large male tiger came in to investigate. The shark cautiously circled the carcass several times before disappearing into the blue. Moments later, it reappeared. For close to an hour, I watched the animal come and go. With its head arched and its nictitating membrane rolled forward, the shark looked ready to take a bite from the carcass a few times, but it never did. Meanwhile, most of the other boats had left and the ruckus above the water had given way to peace and quiet. A tiger shark (Galeocerdo cuvier) at night off Oahu, Hawaii. We were quickly losing light as the sun disappeared behind the horizon. Suddenly, my friend yelled, “blue shark!” I didn’t believe him at first. Hawaii’s blue sharks generally spend their time far offshore in deep water, so sightings are rare. Blues are usually bold and this animal was no different. It would follow us closely, swim off to take a bite out of the carcass and then make another close pass before returning to feast. Natural scavenging at its best! A sperm whale carcass attracts a blue shark (Prionace glauca) off Oahu, Hawaii. Back on the boat, I had a chance to process my recent experience. I felt lucky—thankful for what I had the chance to witness, knowing that I would probably never see anything like this again. The ocean is an amazing place! Fallows, C., Gallagher, A. J., and Hammerschlag, N. (2013). White sharks (Carcharodon carcharias) scavenging on whales and its potential role in further shaping the ecology of an apex predator. PLoS One 8, e60797.